California wine historian Sandrew Montgomery is the go-to guy for an upbeat and diverse wine education or to host an unforgettable wine pairing event. Known in the Sonoma and Napa valleys as the one to deliver “the ultimate California wine experience,” Sandrew’s base is far from limited to New World wines, having begun his career as a professional taster in 1977 in Denver with French cuisine and wines. Since his early years, Montgomery has developed his pairing persona from wine educator to “original, personal sommelier,” launching cult wineries and creating a fun environment to learn about wine and food, whether you come with young taste buds or a seasoned global palate. Sandrew grew up in the South, where dinner table-bottles were bourbon, scotch, and vodka. At 15, he tasted his first wine, Gallo Hearty Burgundy. “That was not my epiphany wine,” he says grinning. Neither was the German Riesling he enjoyed in college, although he was growing more fond of wines and studied about the labels. A Spanish friend introduced him to Rioja, his first favorite of European terroir. The next several years working in French cuisine were an indelible influence in his understanding and appreciation for the varietals found in California’s hills and valleys. He continues, “Then in 1985 the Italians introduced Sangiovese/Chianti and the Super Tuscans, in ’86 Pinot had it’s own profile, and in ’97 ’60 Minutes’ showed a piece called ‘The French Paradox’ that introduced wine as high in antioxidants. Since then we hear about flavonoids that increase the good cholesterol and decrease the bad one, and then resveratrol that is considered a life extender that fights alzheimer’s and certain cancers.” Sandrew’s passion for the timeline is ripe with details. Sandrew’s website, ranges from an extended list of services to sample pairings to favorites, recommendations and events. 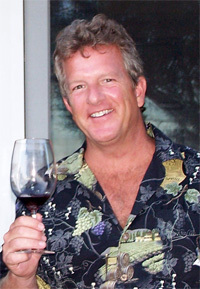 He is also a writer for California Vine Times and a consultant, living in Sonoma County. Enter email for Pairing Matchmaker's flirtation with sensory overload!